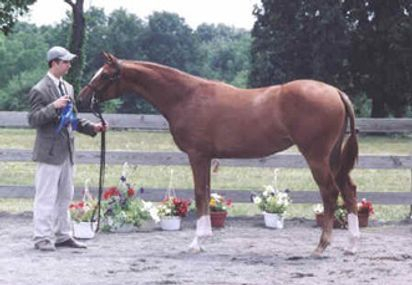 Absolut (Lancaster Avenue), foaled in 1983, is indiputably one of the top hunter producers of all time. 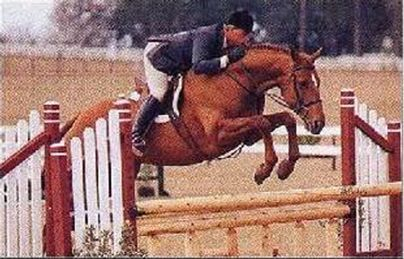 A true performance proven hunter sire, his own highly successful career in the ring included numerous championships in the most competitive hunter divisions and series in the US. His offspring win on the line, in the ring and over fences in the toughest company. His get have won many championships, including in the Working Hunters, Juniors, Amateur and Children's Hunter divisions, as well as young hunter titles and awards at the most prestigious of shows and Futurities. The winnings across such a variety of divisions demonstrate so clearly not only the talent and calibre of Absolut's offspring, but also their consistent trainability and amateur-friendly natures. They are now of an age that they are currently producing their own champion offspring, winning on the line and under saddle. 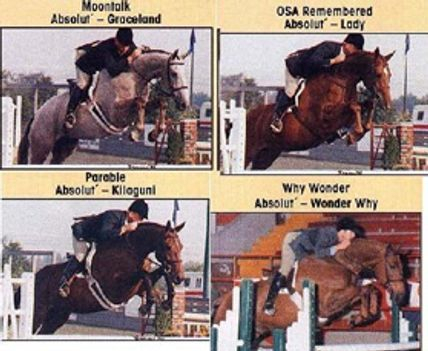 After so many years, Absolut is still 4th on the USEF leading Thoroughbred Hunter Sires list for the 2006 season. He has also had the greatest number of International Hunter Futurity nominated foals of any Thoroughbred stallion. 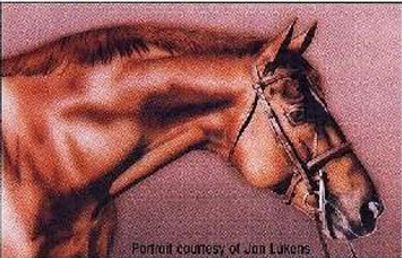 The similarities between Harvest Moon and his sire Absolut are certainly remarkable. 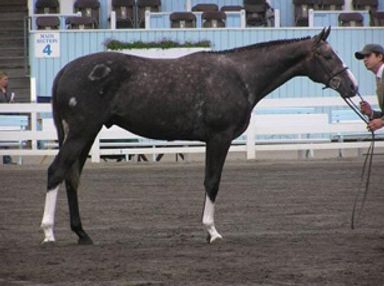 He has without doubt inherited his sire's superb, balanced conformation with a fantastic topline, long correct legs, and stunning head and neck, as well as his presence and colouring. He is truly the spitting image of his sire. Absolut passes on his build, talent and temperament to each of his offspring time after time, and Harvest moon has proven to be no exception. Below is a sampling of champion Absolut offspring showcasing the consistent quality, form and conformation that keeps them in the ribbons. 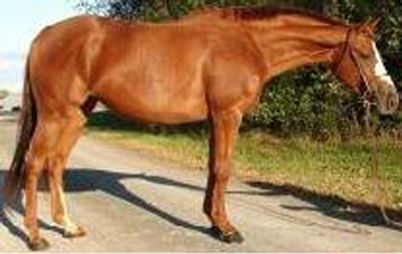 Skim The Moon is a dark bay registered Thoroughbred with a truely enviable record for producing fantastic, top quality hunters. Below, Skim The Moon with her gorgeous 2007 foal by GP's Krugerrand at Symmetry Ranch. Follow The Moon by Zarr: USEF National Reserve Champion. Reserve Best Young Horse. National Hunter Breeding Championships. 5-time class winner at the Devon Horse Show. Upperville winner, Warrenton class winner all three years shown. PHSA and Zone II Champion. Grand Champion PA Yearling Futurity. Chapmion NJ Yearling Futurity. Pictured below. Paper Moon by Zarr: 2nd at Devon, Upperville, and Warrenton, and USEF National Hunter Breeding Championships. 4th Young Hunters U/S Devon Horse Show. 3rd IHF Two Year Old U/S. Pictured below. 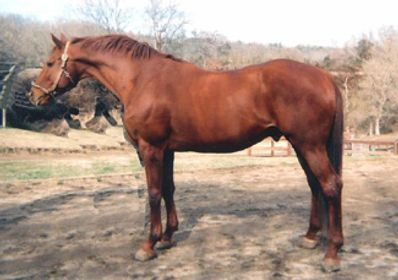 Harvest Moon's extended pedigree is host to the names of a great number of influential stallions found so often in the bloodlines of fantastic hunters and sport horses. 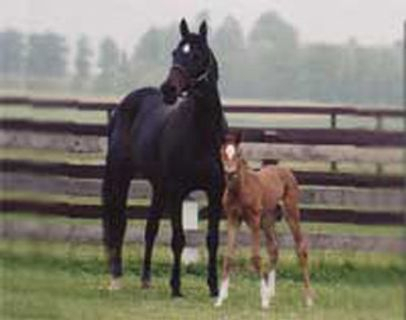 Of particular note we find Annihilate Em, sire to Absolut, and also sire to See Me Come En who sired several very nice hunters before being purchased by a Paint breeding programme, Turn To, a great favorite to hunter breeders, as well as Royal Charger, Nasrullah, Nearco, Mumtaz Begum, Mahmoud, Never Bend, War Relic, Bull Dog and Lavendula, to some the mother of all modern hunters. Patriot Moon, bred by Betsy Morret of Holly Hurst Farm in Carlisle, Pa. Patriot Moon was the blue ribbon winner at Devon as a two year old. 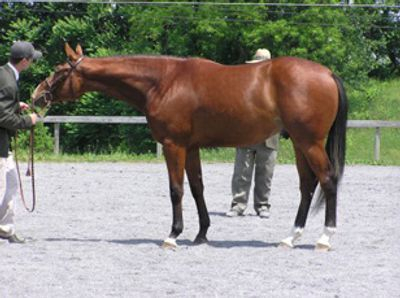 16.2 h+ at 4 years of age, he shows great form over fences, and has a terrific personality. Pictured below. Einstein, bred by Betsy Morret of Holly Hurst Farm in Carlisle, Pa. Einstein was a ribbon winner at Devon as a two year old. 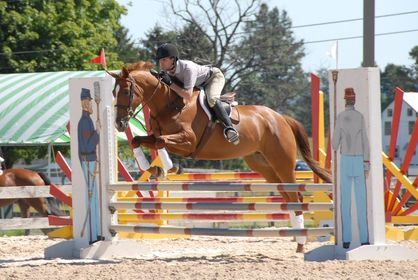 This 17 h 5 year old Oldenburg gelding shows great potential over fences, and is a beautiful mover with a big, easy floating stride. Pictured below. 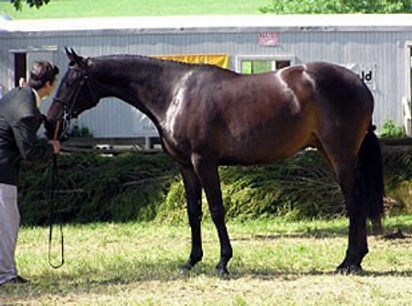 Summer Moon, a stunning 2004 filly bred by Moon Run Farm in North Berwick, Me, owned by Nicholl of New York. Expected to finish 16 h, going nicely under saddle with excellent manners and very little show prep required. She was wonderful to start as a 3 year old, and in the same summer went to her first few shows, wowing everyone with her calm, quiet temperament. A very easy-going girl! Pictured below. Honey Moon, showing in the 3'6" jumpers owned by Jeff Kopenhaver is pictured below.